Disney Festival of Fantasy Parade Now Running At Magic Kingdom! Enchanting stories and characters from Fantasyland come to life for Magic Kingdom guests in a new, daily spectacular – Disney Festival of Fantasy Parade. The parade, which began Sunday, March 9, is already thrilling park guests with eye-filling scenes: a fire-breathing dragon, a pirate ship with smoking cannons, a music box that’s a seashell, sassy Bubble Girls with cotton-candy hair, a mega-sized bagpipe, and more. 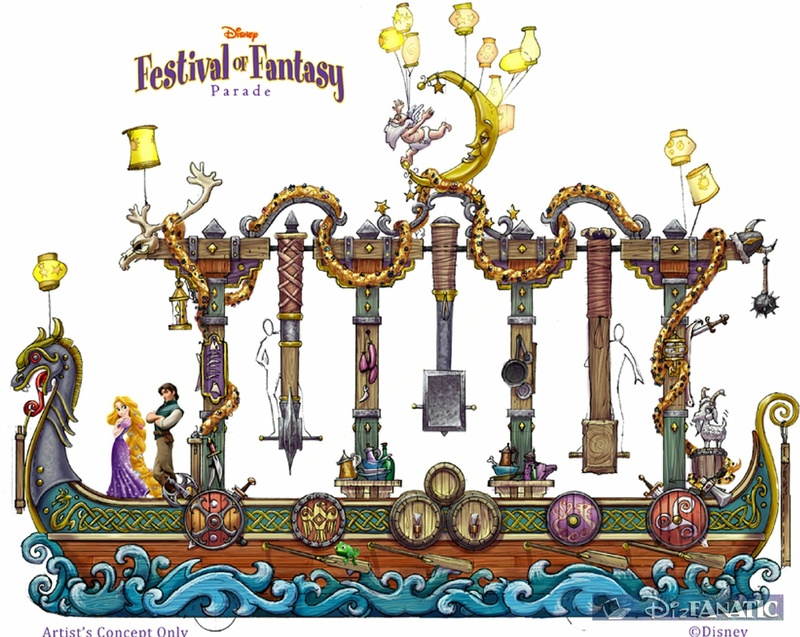 Disney Festival of Fantasy parade is the first of a new generation of parades for Disney Parks featuring never-before-used technology on eye-popping floats adorned with Disney characters from more than a dozen fairytales. Set to an all-new musical score, the dazzling parade floats will soar up to three stories tall with spirited performers donning dramatic costumes crafted at ten different design houses across the country. Seven unique units comprised of nine spectacular floats will march down Main Street, U.S.A to the beat of an original soundtrack inspired by favorite Disney films, composed by Mark Hammond, known for his work on World of Color at Disney California Adventure and the Flights of Fantasy parade at Hong Kong Disneyland. The parade has its own voice with a theme song customized for each float followed by a medley of songs woven throughout the cavalcade. “It’s visually stunning, like mini Broadway shows rolling down the street,” said Wojcik. Little Mermaid – Ariel and her friends sit atop a colorfully kinetic seashell music box that boasts an enchanting musical jubilee. There’s no shortage of whimsy on this Under the Sea float with conga dancing fish kicking up their fins and bubbles galore. Shimmering fabrics and intricately designed costumes for the Lion Fish, Coral Fish, Seashell and Sea Horse performers are runway-inspired. On a perfect sunny Sunday afternoon, Festival of Fantasy opened with rave reviews yesterday in Magic Kingdom! 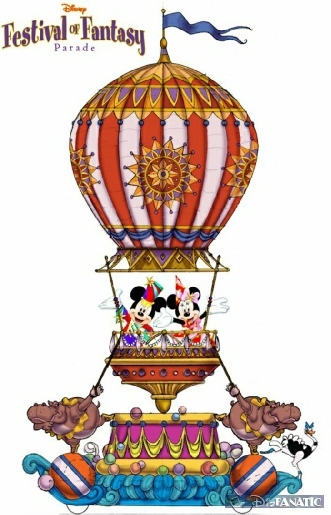 Disney has announced the official debut date for the new Festival of Fantasy Parade will be March 9th 2014! March 2014, Walt Disney World Resort guests will feast their eyes on some of the most extravagant and elaborate costume designs in Disney Parks history when the cast of Disney Festival of Fantasy Parade dance through the streets of Magic Kingdom. 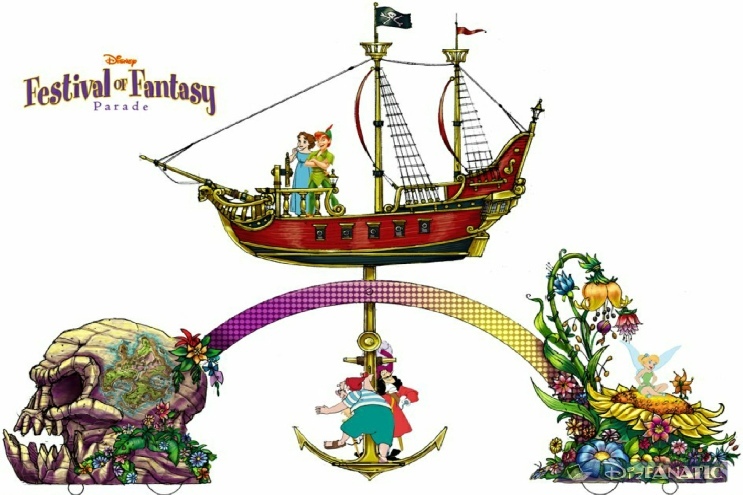 A new daytime parade, Disney Festival of Fantasy Parade is a celebration of New Fantasyland at Magic Kingdom. The parade will bring beloved characters found in this enchanting land to Main Street, U.S.A. with innovative parade floats; a new soundtrack featuring classic favorites from Disney films and an original theme song; and an impressive array of stunning costumes. From first sketch to final stitch, the production process took almost a year to complete. The creations transpired in 10 different costume houses across eight cities and two countries, with the Creative Costuming facilities in both Florida and California among the mix. Costume designer Mirena Rada is no stranger to Disney Parks, as her body of work includes design projects for Disneyland Resort, Tokyo Disney Resort and Hong Kong Disneyland Resort. But when she was brought on to create costumes for Disney Festival of Fantasy Parade, Rada reached a new milestone – designing for a Walt Disney World Resort theme park. From the Swing Thugs aboard the “Tangled” unit’s massive longship to the troupe of Scottish dancers announcing Merida’s arrival in the “Brave” unit, Rada carefully planned and executed the detail of each piece. Visual cues such as color and texture choices were taken from each float and incorporated in the costume designs. Additionally, she closely studied the style guide of each film for whimsical details and fabric patterns to capture the essence of each story. Putting a modern spin on classic elements is a theme that resonates throughout Rada’s designs. From the swan neck collar and iridescent feathers on the Princess Garden unit’s Swan Court ball gowns to the sculpted conch shell headpiece and shimmering pastel dress that comprise “The Little Mermaid” unit’s Seashell Girl, the old and new are blended seamlessly – a trend that is ever present in today’s fashion world. The production process mirrors current fashion trends, utilizing new technology to design and print custom fabrics in house. Rada partnered with Walt Disney World Resort costumers to select fabrics that would withstand the central Florida climate while also accommodating the needs of each performer. After gathering the materials, she and a Creative Costuming graphic artist worked together to create almost 40 custom fabric prints. This includes the spandex swirls on the Finale unit’s bright and beautiful Bubble Girl, expansive fins of “The Little Mermaid” unit’s regal Lion Fish and furry plaids and tweed stripes worn by the “Newsies inspired” Lost Boys of the “Peter Pan” unit. An innovative 3D printing technology brought to life even Rada’s most intricate concepts, with the hauntingly elegant beaks of the Ravens in the “Sleeping Beauty” unit being a prime example. Using a 3D origami program, a paper beak was created and placed on a performer’s head to obtain the initial scale and shape. A digital sculptor then worked on the filigree beak design, which was printed, fitted and refined to produce the final shape. Each piece was base coated, bronzed, lacquered and gilded with fiery Swarovski stones to complete the finished look. In the true spirit of fashion, each look was not considered complete until complemented by the perfect hair, makeup and accessories. The Finale unit’s Cha Cha Girl is the queen of head-to-toe ensemble with her big top inspired fit and flare dress, bolero jacket embellished with sequins, star spangled tights and hair reminiscent of pulled taffy exuding the essence of Storybook Circus in New Fantasyland. However, simple touches that might elude guests, such as the elegant gold tones incorporated into eyelashes on the female Swan Court members, and in the custom socks worn by the Lost Boys were not overlooked – a testament to Disney’s attention to detail. Elaborate costumes are being crafted by 10 different costume houses, in eight cities, in two countries — including Creative Costuming facilities in both Florida and California. Some 27 separate custom designed fabrics were designed by Mirena Rada in collaboration with Creative Costuming Graphic Artist Paul Jordan. Counting interfacings and trims, it takes 28 separate fabrics to make up one Swing Thug #1 Costume (Tangled unit). His vest requires vinyl to be cut into 75 separate diamond shapes and then stitched onto cool max fabric. Some pieces, including the Seashell Girl (Little Mermaid unit) headpiece, were digitally sculpted and then grown to size with a 3D printer. It takes 30 yards of fabric to make one Seashell Girl costume which includes 12 different colors of Nitex Mesh. Creative Costuming Craft Team and baked and finished for 16 hours each in an oven. The socks worn by the Lost Boys (Peter Pan unit) are custom designs that were knitted to order in Hong Kong. Minnie Mouse’s Dress and Hat (finale unit) uses 95 gold lame dots that are cut out, “blinged out,” and then sewn on. The Bubble Girl (finale unit) headpiece is made from three separate clown wigs that are blended together by the Creative Costuming Millinery Team. Cha Cha Girl (finale unit) – Her wig was designed with 148 yards of horsehair in four colors, that is then rolled, pressed and curled by hand. The Steampunk-inspired Maleficent Dragon stretches 53 feet from snout to tail and reaches 26 feet in the air. Walt Disney Parks and Resorts Creative Entertainment team members partnered with Tony Award-winning designer Michael Curry on the development of the Maleficent Dragon. 04/27/2013 - Yesterday at a press event, Disney announced that a new daytime parade, the Disney Festival of Fantasy Parade, will march into Walt Disney World’s Magic Kingdom in spring 2014. The Disney Festival of Fantasy Parade will bring the magical stories of New Fantasyland to Main Street, U.S.A., through fantastic and innovative new parade floats, vibrant costumes, and an original soundtrack that will feature beloved songs from favorite Disney films, plus a new parade theme song. We’ll have more on this as the story develops!